The consensus among surname origin researchers is that the surname Dunbabin is derived from Dunn, meaning dark or swarthy, and Babin, a pet name derived from the personal name Robin. The next favourite for the origin is that the first element comes from the Gaelic "dun" a hill, and the second element might be Gaelic "babhunn" (plural sometimes babhainn) a rampant, bulwark. The apparently similar surname Donovan seems to be unconnected, being of Irish origin. The vast majority of early references to people with the surname Dunbabin are from the area around Warrington, which was on the border of Lancashire and Cheshire, but is now administered as part of Cheshire. A Richard Dunbabin was baptised at Runcorn down the river on the first of January 1562. A John Dunbabine was baptised at Winwick just to the north on 11 August 1577. The will of Richard Dunbabin, yeoman of Acton, two miles southwest of Warrington, was proved in 1582. A William Dunbabin was baptised at Frodsham just down the Mersey on 7th September 1595, and the name had spread south to London soon after this - Ellenor Dunbabyne married Joseph Harcocke there in 1623. The first reference I can find in Ireland is the baptism of a William Dunbavin, son of William and Mary, at St. Catherine's church in Dublin on 11 July 1684. The variant Donbavand appears somewhat later. 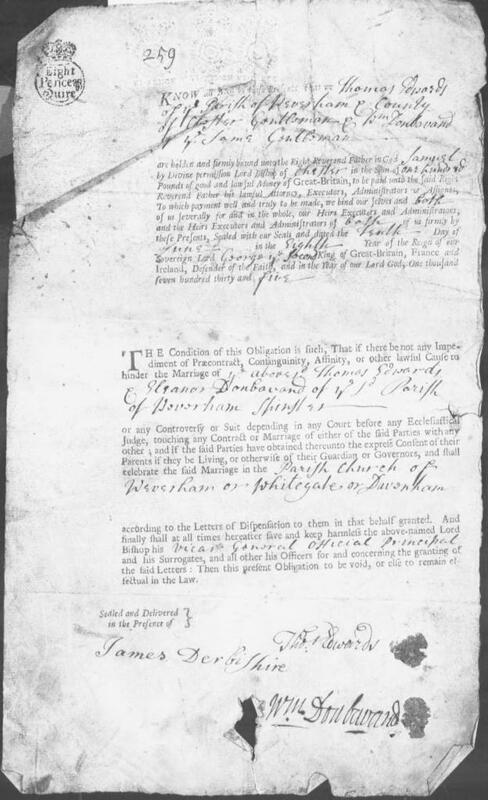 The earliest document I have found so far where a family member uses that spelling is a marriage bond for the marriage of Eleanor Donbavand to Thomas Edwards at St. Mary's in Weaverham in June 1735. Her father William's signature is clear enough. April 4th 1862 aged 78 Years. At least one branch of the family visited the Carribean. Nicholas Dunbavin was buying property in the Danish colony of St. Croix (now the US Virgin Islands) in 1748. It is almost certainly this branch which owned slaves, descendants of whom continue to live on the island and on the mainland of the U.S.A. The Dublin branch shares the Nicholas given name and Dunbavin surname in the correct timeframe, so this seems to be the most likely origin of this offshoot. The story widespread in all branches of the Donbavand families that the name is from Spain is unlikely to be true. It appears to originate because "Don" is used to denote high status in Spain. DUNBOBIN The conversion of the central "A" into an "O" allows a link to be made with the textile industry. Now extinct. DONBAVAN A quite obvious intermediate form. DUNDAVEN A sub-variant of DUNDAVAN, now extinct. DUNBADEN A variant in the USA from a Henry Dunbabin who emigrated from Liverpool in the 1850s. There are also numerous variations (known as deviants) generated through poor transcription or plain bad handwriting. Transcriptions with an R rather than a V are legion, M rather than N is very common too. However the most obscure transcription I've come across was a marriage in 1863 at All Saints', Stand. John DUNBABIN married Esther CRANSHAW. I only traced the marriage through the maiden name on their children's birth registrations. This was a case of poor handwriting; the GRO index has the event filed under BUMBAION, and so does the local Register Office. Either "O" or "U". There is very little difference between the pronunciation of these vowels. "NB" Only two families have anything else. A vowel, usually "A" or "O". Either ""B" or "V". Again, there is little difference between the sounds. A "B" just starts with the lips together. Gaelic still confuses these letters - think of the pronunciation of the name "Siobhan". A harder final letter can be added to some variants, usually "D"
Here is a link to a copy of the Donbavand tree on RootsWeb. The database currently contains over 400 trees or tree fragments. Some of these trees contain several hundred individuals, some only a single person, for example the record of a baptism in the period before even the father's name was mentioned. Please note that RootsWeb does not show data for persons which it reckons are still alive. I have been building a spreadsheet with the Birth, Marriage and Death registrations of the Donbavand family members. Other sheets in this file have data from other sources. The latest changes include birth and death registrations from 2006-2015 and marriages from 2006-2014. A recent enhancement to the website of the General Register Office has enabled many children who died in infancy to be attached to the right parents and most middle names to be shown rather than just initials. To download a copy, . This copy was updated 16th February 2018. The spreadsheet is not exhaustive; I am discovering mistranscriptions and variants all the time. Those entries highlighted in yellow have the event recorded in the data uploaded to RootsWeb, usually with the date recorded to within a three month period. Some may have more accurate dates derived from other sources, such as a birth date from a baptism record or a later-style death register. Events highlighted in green have further detail, usually the text from a marriage register entry or certificate. Events fighlighted in red are those which I think ought to be easy to research. Often I will be wrong about that, but it serves me as a reminder. I have, inevitably, acquired a few certificates for events in the Donbavand and Dunbabin families. You can download these by clicking the following link. Before 1837, there were no certificates of Birth, Marriages and Deaths. However, baptisms, marriages and burials were recorded in the registers of churches and other religious organisations. The most detailed of these records were kept by the Society of Friends, or Quakers. I have reconstructed several trees and fragments of trees. Some of these could best be described as twigs, some even as leaves, having no obvious relatives. There are currently over 400 trees or tree fragments, being the total number of people with the surname in my database for whom I do not know at least one parent. The aim is to slowly reduce this number by joining together trees or fragments as evidence is discovered. Of course, if you have evidence of any sort that my tree reconstructions are wrong, please let me know. Some of the links are made on a balance of probabilities, and although I strive to locate evidence of all types, there is much more to be known. Some of these will never be joined onto any other tree, as there are no appropriate records to allow this. The Randall Dunbabin who was buried at Daresbury in 1613 has no other known record to indicate a date or place of birth. I can guess that (s)he was over 21, as no father is mentioned, but only the place of death is given. It is not even clear whether Randall is male or female. The major trees are extracted here. There are few details of individuals; dates and places of births, marriages and deaths are shown when known. For most of the people mentioned I have much more data in the master database. Each of these trees contains several hundred individuals. Note that living people are mentioned here. Dates of birth and marriage are derived from parish registers, the General Register Office and local Register Office indexes, which are publicly available, and from other websites, such as social media. 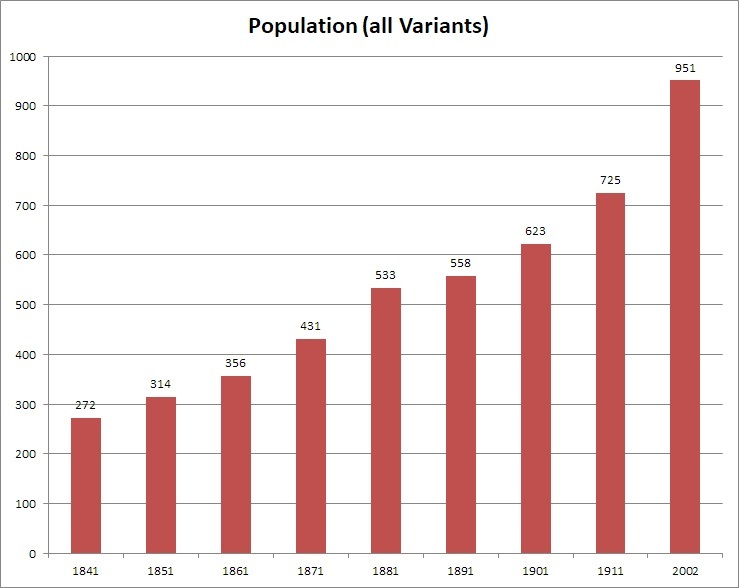 Adding up the numbers of people using the name and all its variants from the various censuses gives an indication of the growth of the population. The vast majority of entries are from England; a few are from Wales and a small number from Scotland. Records from outside the UK are not shown. A column has been added to show the 21st century population from the ONS figures mentioned earlier. All variants and deviants are included in these figures. The number of mistranscriptions, both in the original census sheets and by modern indexers, means that there is little point in differentiating between the many spellings used. A legal document dated 2 Dec 1806 refers to "a messuage or burgage in HALTON theretofore called Dunbabins or Lawrinsons Tenement or House and its lands called the Backside, the Brook Heyes, Dunbabins Meadow alias Dunbabins Bank Meadow"
In 1835 a document for the Edge Hill, West Derby, to Netherley Bridge, Little Woolton turnpike refers to a branch "from Dunbabins, Wavertree, to Lodge Lane, Toxteth Park". Could this be a reference to "Dunbabin Road" which had acquired the name by 1892? On the corner of Dunbabin Road and Woolton Road stood Dunbabin Farm, but by 1937 the property had disappeared under housing and a tennis club. Mount Damavand, the highest peak in Iran, is sometimes referred to as Mount Donbavand, but there is no known link with the surname. Salt Spring Island, just off Vancouver Island, British Columbia, has a Dunbabin Park, which contains a hiking trail called the Dunbabin Trail. I've now discovered that the park was named after the Dunbabin family branch from California, who owned property nearby. In The Gurdies, south east of Melbourne, is Dunbabbin Road, which has to be named after the Dunbabin family descended from John Dunbabin, who emigrated in 1853. A small town called Dunlavin, in Co. Wicklow, Ireland, may be the origin of the Irish branch, who always used the variant Dunbavin. The family used the church at Naas, only 12 miles away. A townland called Dundavan, in Co. Cavan, Ireland, has no known links with the surname variant. An area of Coatbridge, Lanarkshire, called Dundyvan has no known links with the surname, but may be linked to Co. Cavan through the 19th century wave of immigrants from Ireland. The information about people in this study is taken from many sources. The majority are public records such as censuses, electoral rolls and registrations of births, marriages and deaths. Other details are taken from newspaper articles, which may or may not have been checked with the people involved. Some relationships have been worked out from unconventional sources, such as mentions on social media accounts. All information shown on this site has been worked out from published sources. The online data visible at www.rootsweb.com may contain data from any source, but data about people who are believed to be living is not shown. If you feel that information appears in any of my online data which should be private, please contact me.